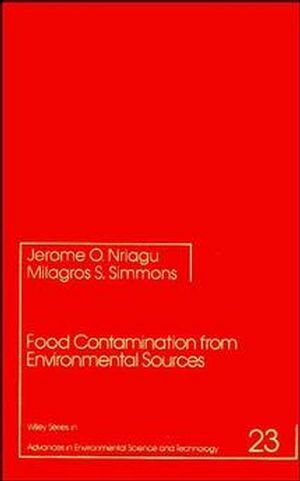 Addresses issues in the contamination of food from environmental sources, considering the persistence of some toxic substances in the human food chain and the toxicological and health significance of observed contaminant levels. Provides critical and timely reviews on detection, sources, distribution, speciation and the bioavailability of environmental contaminants and their metabolites in various food products. JEROME O. NRIAGU is Professor in the Department of Environmental and Industrial Health, School of Public Health, the University of Michigan, and an adjunct professor at the University of Waterloo. For many years he was a research scientist with the National Water Research Institute, Burlington, Ontario. He is the editor of the Wiley Series in Advances in Environmental Science and Technology and has edited, among many other volumes, Nickel and Human Health, Arsenic in the Environment, and Thallium in the Environment. Dr. Nriagu received BSc and DSc degrees from the University of Ibadan, Nigeria, an MS from the University of Wisconsin, Madison, and a PhD in geochemistry from the University of Toronto. He has published extensively in leading geochemical and environmental science journals and has received a number of awards for his work. He is a Fellow of the Royal Society of Canada. Agricultural and Related Chemical Contamination in Foods: AnHistorical Perspective (D. Matthees). Food Contamination with Cadmium in the Environment (J.Nriagu). Food Contamination with Arsenic in the Environment (J. Nriagu &J. Azcue). Residues of Dithiocarbamate Fungicides in Fruits, Vegetables, andSome Field Crops (N. Smart). Pesticide Contamination of Food in the United States (A. Kulkarni& M. Ashoke). Environmental Contamination of Food by Nitrosamines Derived fromPesticides (A. Khayat). Pasteurized Diary Products: The Constraints Imposed byEnvironmental Contamination (J. Phillips & M. Griffiths). Food Residues from Pesticides and Environmental Pollutants inOntario (R. Franks & B. Ripley). Environmental Contaminants in Mexican Food (L. Alberts). Use of Organochlorine Pesticides for Pest Control in Buildings: TheEffect on Occupants (C. Stacey). Viral Disease Transmission by Seafood (R. De Leon & C.Gerba).